Hackspace 2.5 is the new downstairs section of our space. It is a work in progress but has partly opened up for general use. Currently Electronics, CNC and the Blue Room are fully opened. You will find the main route to Hackspace 2.5 is sign posted from the back door of the Hackspace 2.0 Metalworking Area. It's also possible to access this area from the street level doors on Roden Street at the north side of the building. Note: Floor Plans are stored on the Nottinghack github page. Work on Hackspace 2.5 started after a decision to proceed with the project at the AGM on 2015-12-03. A dedicated team of members have been working on the space every Tuesday night since we got the keys to the unit. 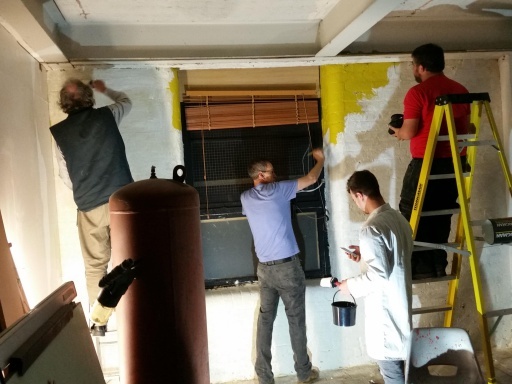 If you would like to help out, join the Hackspace 2.5 slack channel or read more on the Volunteering page. Some of the progress is documented on the Hackspace 2.5 Project page.